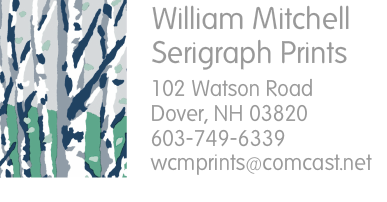 Born in Holyoke, MA., and raised in Catskill, N.Y., Printmaker William Mitchell moved to NH in 1983 and began creating silkscreens of the NH landscape. 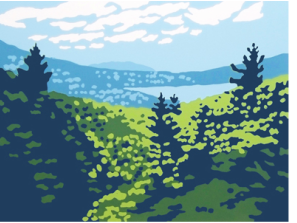 When Mitchell depicts a NH mountain, forest or river, the resulting image is both familiar and brand new. Mitchell's brightly colored prints portray places of special beauty and meaning to him. 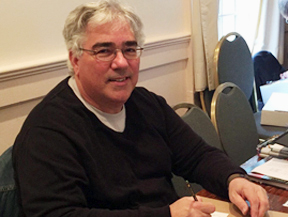 Mitchell, a high school art teacher, lives in Dover, NH with his wife Mary. This has been a three year mission for me; to illustrate each of the 79 episodes of Star Trek. The task seemed very ambitious at the start, but one by one the images were researched and completed. I have been a fan of Star Trek for over 50 years now with memories of attending the earliest NYC conventions. I am sorry to complete this project because it was a lot of fun revisiting Star Trek in a special way. Enjoy my efforts! Thanks for joining me at this wonderful event. I hope to see you once again next fall in downtown Concord. Watch the new video to learn about the League of New Hampshire Craftsmen and the artists that make it special. Thank you for a great League of NH Craftsmen's Fair August 4-12, 2018! Starting the first Saturday in August and running for nine days, the Annual League of NH Craftsmen's Fair showcases the work of some of the finest craftspeople in the country. See and shop for one-of-a-kind fine craft that is both beautiful and functional. Meet the makers and learn about their vision and passion for their craft. Here are some of my memories of the 2017 and 2018 fairs where I exhibited my silkscreen prints and offered daily classes in printmaking. See you at the 86th Craftsmen's Fair in 2019!